I’m willing to bet a few dollars that your roof leak is probably happening in the same place as Geri’s. Based on my forty-plus years of clambering around on roofs, I’m of the opinion that well over ninety percent of roof leaks happen at flashings. You’ll also find roof flashings where a lower roof touches up against a taller wall of your home or a neighboring building like the condo next door or the walkup next to your home. Roof flashings can be made from thin metal, rubber, and a few other materials. Some flashings are built into products like a bathroom vent roof cap or the standard plumbing vent pipe flashing. Flashings can be challenging for a rookie roofer. Some flashings are easy to install while others require considerable skill and an understanding of basic physics principles. I prefer roof flashings made from metal that can be soldered. Copper, galvanized steel, lead, and traditional tin-plated steel are examples of these fine materials. Standard caulk and black roofing cement are not acceptable materials to use with flashings. The sun’s powerful ultraviolet (UV) light breaks down these materials in a few years. 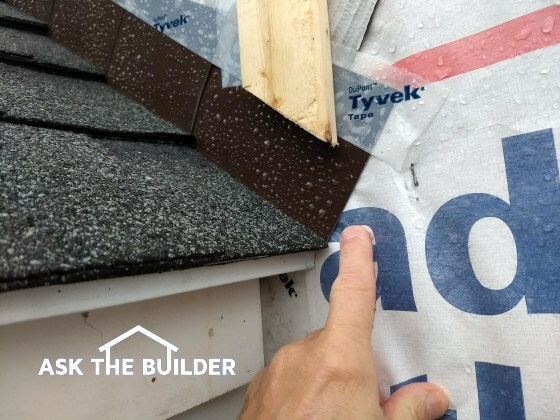 It’s okay to use caulk and roofing cement as a last resort to make a temporary leak repair, but don’t allow a roofer to convince you they’ll work for the long term. There are countless brick and stone chimneys out there and you may have one on your home. Chimneys are expensive to repair so you want to keep yours in excellent shape. A chimney crown is the roof of a chimney. Just as the roof on your home keeps water from entering the center of your home, a chimney crown prevents water from soaking down into the core of the chimney. Just about every chimney crown I’ve ever seen has been installed wrong. The best ones have a flashing membrane under the crown material to capture any water that might leak through the actual crown material. Crowns are supposed to be overhang the chimney and have a drip kerf on the underside of the overhang. The crown material should be made using concrete that has a blend of hydrated lime, Portland cement, and small pea-sized gravel. Many bricklayers just use the regular mortar mix for the crown material and they taper it down to the edge of the last row of brick. This is a big mistake and the Brick Industry Association frowns on this poor practice. The chimney crown should not touch up against the clay flue liners that are in the center of the chimney. These should be surrounded by a layer of foam so the flue liner can expand and contract without exerting pressure on the crown material. A special high-performance caulk that resists UV degradation fills the top 3/8 of an inch where the crown material is adjacent to the clay flue liners.